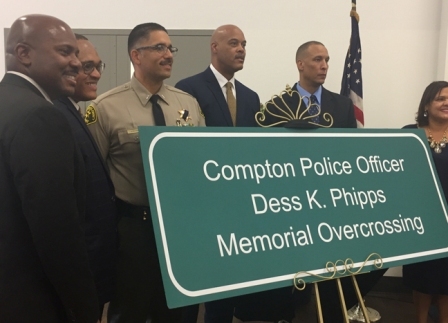 Families, fellow officers, friends and community members gathered Saturday, Sept. 19, 2016 at the Dollarhide Community Center in Compton to honor the memories of Compton police officers Kevin Michael Burrell, James Wayne Johnson and Dess K. Phipps who lost their lives in the line of duty. Assemblymember Mike A. Gipson, (D-Carson), a former police officer, authored ACR178 which allows for the renaming of portions of the 710 freeway and 91 freeway. The areas will be marked by memorial signs to be erected. The program began with an introduction by Compton Councilwoman Janna Zurita, musical selections by the Centennial High School Jazz Orchestra and a presentation of flags by Enterprise Middle School Color Guard. Los Angeles County Sheriff Jim McDonnell; Captain Michael Thatcher; Lieutenant Eric Strong; Lieutenant Reginald Wright; and Deputy Gary Davis acknowledged the families and made remarks including praise for Sergeant Frederick Reynolds who pursued the memorial signage for many years before teaming up with Asm. Gipson who secured the state resolution which moved the project forward.